Last year I got a handful of tea from a small tea garden near Yi Bang, that in turn led to Jing Jia Tang exploring the Yi Bang area last Autumn and, this Spring, they sourced some tea from one of the villages near Yi Bang ‘Gai’. Yi Bang has a mix of trees but is known for its xiao ye zhong* old tree gardens, but tea from these villages particularly is limited, and not much gets into the wider Puer market. These are 200g cakes, nicely pressed, and as mentioned previously, a little tighter than many stone-pressed cakes. Plenty of tips and minimal huang pian. 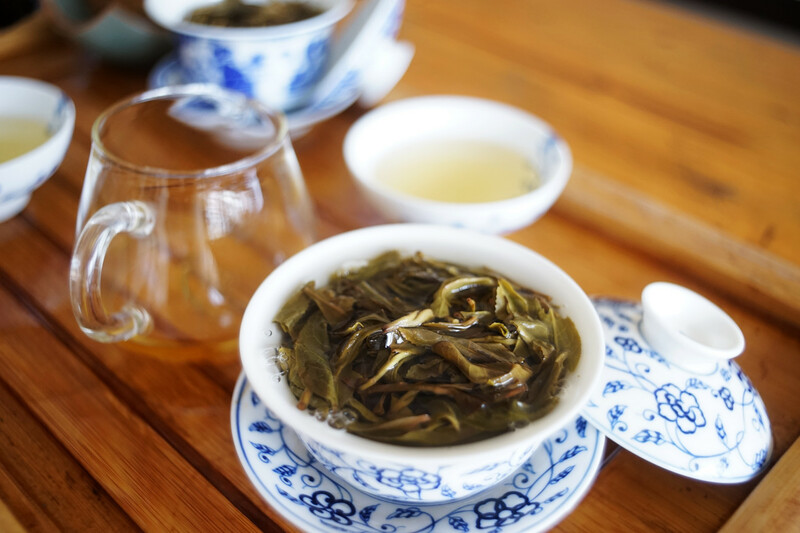 After the first steep, the gai wain lid is predominantly honey and flowers. The ru kou is quite forceful – maybe even ‘meaty’. The cha wei is distinct. The broth feels smooth in the mouth. The sheng jing is interesting, extending as it does under the tongue and inside the cheeks. This tea does not, for the moment at least, have the thickness that this years Qing Sheng has -but that’s no surprise – and in any case, it’s enough. The tea is not left lacking. Together with some astringence , which is enough to give the tea some structure without being overbearing, and a light bitterness, the overall feeling is of a well balanced drink. The hui gan is good and there are some distinct retro-olfactory floral aromas. The cha qi feels quite substantial and has some depth: the tea sinking well enough into the thorax. 200g cakes available here from Jing Jia Tang Taobao shop, email there or here for samples and further information. The Yi Bang tea that everyone knows about is Man Song,chiefly for it’s claim as an origin of gong ting or Tribute Tea. The other villages and tea gardens are less well understood. Apart from a couple of exceptions, Yi Bang tends to command a hire price for tea than the rest of the Xiang Ming area. In all, including Lao Gai, He Bian Dui, Man Gong, Ma Li Shu, Mi Bu, etc. there are about 3000 mu ( 200 hectares) of ancient tea tree gardens. Jing Jia Tang sourced this tea from a tea garden of ancient tea trees, a good environment, where the earth has not be turned (an unfortunately increasingly common practice that has a negative impact on the trees and the tea flavour) and where there were sufficient shade trees. Over a period of three days they made about 10 kg of tea.